We are in love with Amaranta By Oberoi and their take on the Indian cuisine. They’ve recently brought a new tasting menu to their already awesome selection, and here’s the lowdown. Someone who loves to experiment with Indian cuisine and would love it to be paired with a modern twist. 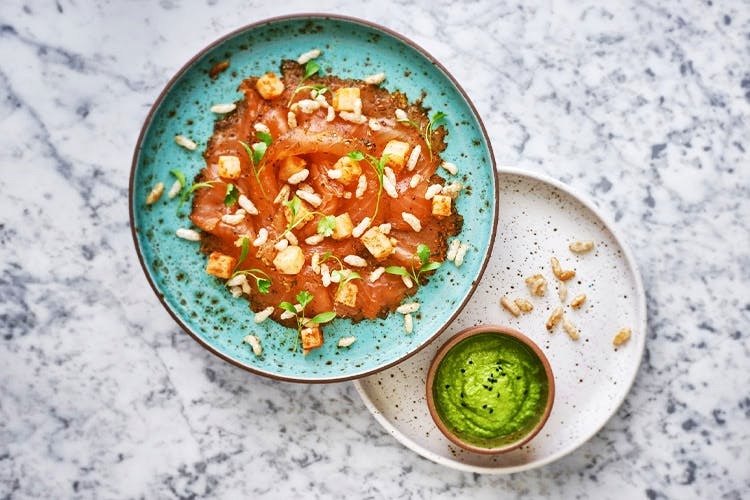 This nine-course tasting menu has been prepared by chef Vivek Singh of The Cinnamon Club, London in collaboration with chef Tejas Sovani of the Amaranta Restaurant. Well, Amaranta is definitely up there as a fine-dining restaurant when it comes to ambience; the whole feel is quite classy. The crockery keeps changing and evolving according to the dish being served, which adds to the oomph of the whole menu. The menu took three months to finalise, and we must say it was worth the wait. We started off with a Dhokla Ya Pakoda which was basically a dhokla inside a pakora, and it played with our palate so well. It went on to include Carpaccio of cured Scottish salmon, which was delicious to say the least. But the ‘best’ was definitely the Surf n Turf, which is a pairing of a scallop and lamb galouti, and the Charcoal, which is minced chicken covered in activated charcoal. The meal ends with a beautiful garam masala sticky toffee pudding with clove ice cream. We highly recommend that you go for this tasting menu and even take guests who are visiting India, for this is definitely a journey across the country through some really delicious food.